The August 13 Heart show at Fraze Pavilion has now been re-scheduled for Tuesday, June 16, 2015 at 8pm. From June 2 to July 2, you can enter a chance to win a trip on the GRAMMY� Festival at Sea cruise. CharityBuzz - Win a M&G with Heart! Heart is a proud participant in Charity Buzz, a place to find extraordinary experiences to benefit remarkable charities making an impact. Heart to appear on "Set Them Free"
Top Grammy Award Winning Stars and Rock and Roll Hall Of Famers are joining forces in the recording studio to create an all star music compilation album in support of Rock Against Trafficking (R.A.T. ), a nonprofit organization committed to the awareness and prevention of child slavery. Ann and Nancy Wilson will appear at Los Angeles' famed Greek Theater on June 6 as part of a live performance Taping for A Prairie Home Companion. Ann Wilson on Jimmy Fallon Mar 21! Ann Wilson will be performing with The Tonight Night Show Host's backing band, The Roots on Friday March 21. WHAT: "Kiss the Sky! The Orca Freedom Concert" WHERE: EMP Museum's "Sky Church" in Seattle, WA. WHEN: Earth Day � the Evening of April 22, 2014 / Doors Open at 6:30pm, Show Starts at 7:30pm. BENEFITTING: Wild Orca Research and Advocacy. 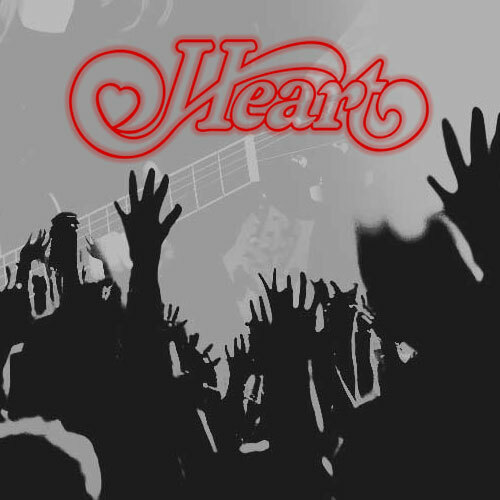 Heart's newest album, Fanatic Live from Caesars Colosseum, is available everywhere now! Read More for links to purchase! Watch Heart with Linkin Park, The Offspring, Bad Religion and Special Guests perform in Concert for the Philippines to support relief and recovery following Typhoon Haiyan. The Concert will be broadcast on AXS TV this Saturday February 15th at 8 pm EST / 5 pm PST.